Obviously, everyone is welcome at the Karaoke Shack from KJ's to those who just like to sing. Indeed, join the Karaoke Forum Too! 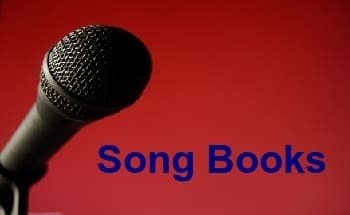 We make custom karaoke song books too - tell us what you need! Firstly, the Karaoke Shack has best of both worlds. Indeed, you can start a new thread in the improved karaoke forum. Obviously, the forum has many categories including one for karaoke hardware and software issues. Also, there is a section for karaoke news and a general forum to chill out in. The Karaoke forum also includes a section where you can present your own songs for the world to listen. So, pop over and register there as well! The Karaoke Shack has all the old and new karaoke manufactures in our lists of course. We also have all the discs and tracks from all those lists in our database. Indeed, we have all those available for anyone to cross-reference free of charge. Moreover, you can download those song books too. However, we also make custom designed karaoke song books as well. So, tell us what your requirements are and send a logo if necessary and we will do the rest. The karaoke shack is obviously all about karaoke discs and songs. We also promote karaoke manufacturers wherever we can. In particular, those who currently produce karaoke. After all, they have always been, and still are the lifeblood for karaoke jockeys world-wide. Moreover, we have a full list of all the karaoke disc ID numbers. Indeed, this is our karaoke directory. The Karaoke Shack is constantly developing, so if you find any mistakes, let us know. The main aim of the Karaoke Shack is to promote karaoke songs and karaoke discs in general. Obviously, helping those who love karaoke too. We also promote karaoke hardware and software to help budding singers and karaoke jockeys (KJ's) with their set-ups. However, there is a lot more going on at the Shack. For example, our legendary karaoke song books are available to download with a personal touch now. So, register and join in today! To begin with, the Karaoke Shack is a hub for all karaoke enthusiasts. Indeed, we have a bigger blog and a much improved karaoke forum to discuss all karaoke matters. Obviously we cover the lot, from karaoke gear to karaoke discs. In particular, we promote karaoke discs. However, most karaoke labels have long disappeared from the shops but are still available second-hand. Many karaoke songs are also duplications on the various labels. So, we are hoping to get the best value for money from the available karaoke discs by avoiding the dupes. So, here is your chance to help all karaoke disc collectors by commenting or reviewing the labels. We welcome new members as well as previous members and invite you to comment on all karaoke issues. Moreover, join in with us here at the Karaoke Shack and help inform karaoke collectors across the world. You can state your opinions on past and present karaoke discs, or indeed tell us about your experiences with karaoke. If you have any information about karaoke then let us know here or in our karaoke forum. If you would like an article published without joining, then contact us and we will do it for you anonymously.